Allison Stoutland sowed seeds of wisdom in the lives of those who heard her address at the Doing What Matters for Alabama’s Children Conference at The University of Alabama Tuesday. In the course of a year, I hear a lot of speeches at conferences, workshops and meetings. Allison Stoutland has published several children’s books and currently lives in Tuscaloosa, Ala. where her husband, Jeff, serves as the offensive line coach for the 2012 National Champion Alabama Crimson Tide. 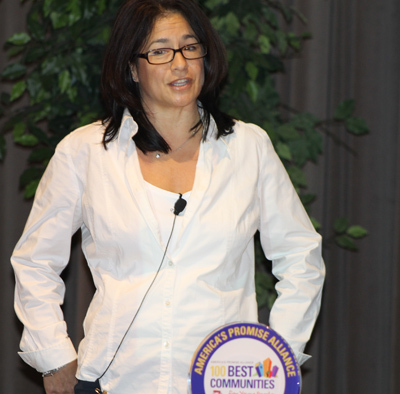 Few can compare to the address today by Allison Stoutland, a children’s book author and coach’s wife, who spoke at the Doing What Matters Conference For Alabama’s Children Conference at The University of Alabama. Allison Jo Stoutland, children’s book author and wife of Alabama Offensive Line Coach Jeff Stoutland, will speak Tuesday at the Doing What Matters for Alabama’s Children Conference at the University of Alabama in Tuscaloosa. Terry Saban, wife of Alabama Head Football Coach Nick Saban, isn’t the only football coach’s wife making the headlines these days. On Tuesday, I’ll get a chance to hear Allison Jo Stoutland tell her story at the “Doing What Matters for Alabama’s Children” Conference. Stoutland is Crimson Tide Offensive Line Coach Jeff Stoutland’s better half. I was just looking over the line-up for Tuesday’s event and discovered an unfamiliar name. I’m like ‘Who’s Allison Stoutland?’ Why is she on the conference program with State School Superintendent Tommy Bice? Turns out Stoutland had beenfeatured in TUSCALOOSA Magazine for her work as a children’s author and co-owner of Inch-by-Inch Publications. She’s author of The Sad Flower. Like my mother, Sallie Daniels, Stoutland has taught kindergarten. Her Twitter profile says she’s also a dog owner, baker and gardner. While I don’t have children yet, I certainly want to find out more about this local celebrity writer, who’s connected to our University of Alabama campus. Perhaps she has some wisdom for future parents like me. Stoutland is set to give her talk at the Bryant Conference Center Tuesday at 10:15 a.m.
What Makes Tuscaloosa One of the BEST Places For Young People? Tuscaloosa County has won the distinction of being one of the 100 Best Places for Young People, for the third year in a row. I’ve been in Tuscaloosa for a decade now. But, I have not always believed we had the absolute best schools. That’s primarily due to the lack of funding for education. Still, despite my own perceptions, Tuscaloosa County continues to rank among the America’s 100 Best Places For Young People. Tomorrow, Tuscaloosa Mayor Walt Maddox, Northport Mayor Bobby Herndon and Judge Hardy McCollum, who was recently elected to his seventh term as Probate Judge of Tuscaloosa County, will gather for an official presentation of the national award. This is the THIRD YEAR in a row Tuscaloosa County has won the award. The only other Alabama communities to win such as distinction in 2012 are Sylacauga and Mobile. According to the 100 Best Communities for Young People Web site, Tuscaloosa County was recognized because it hosts programs to support healthy youth development such as FocusFirst and the Maude Whatley Health Clinic mobile van. Professor Stephen Black from FocusFirst, will be among the speakers at Tuesday’s gathering at the Bryant Conference Center. Community partnerships such as one between the Tuscaloosa district attorney’s office and the local sheriff’s office and the Tuscaloosa City Schools. The venue for the presentation of this latest award Tuesday will be the Doing What Matters for Alabama’s Children Conference, the seventh such event. During the conference, I look forward to hearing more about the state of our community’s efforts to help children in 2013. Author George DanielsPosted on January 28, 2013 Categories TuscaloosaTags 100 Best Places for Young People, Alabama, Children, Mayor Walt Maddox, Tuscaloosa, Tuscaloosa CityLeave a comment on What Makes Tuscaloosa One of the BEST Places For Young People? Food Blog South 2013 gave me 10 Takeaways to make the work I present here as a blogger better. And, I’m just about ready to offer insights related to food elsewhere on the World Wide Web. HOMEWOOD, Ala. — After spending an entire Saturday talking about food at Food Blog South 2013, I am just full of ideas as I plan to eventually provide some blog posts that focus on the subject of food in the very, very near future. Outside of an alert, those food-related posts WON’T BE HERE on this blog. But, you’ll be the first to know when I launch into this area of interest in a space that I’ve had set aside for a couple of years. Today, I had the pleasure of participating in what I think was the BEST conference I’ve ever attended on JUST the subject of blogging. We talk about the kind of stuff I do here all the time at journalism gatherings. But, most of time, it’s a single 75-minute session or a mini-workshop or seminar with a few tips and that’s it. Since eight o’clock this morning, I’ve been hearing the stories of those who have been blogging for many years and some who have started only recently. I heard firsthand how blogging can make a difference in one’s life– beyond just in the information or insight provided. Kenji Lopez-Alt of Serious Eats, offered several good pieces of advice to bloggers at the food blog South 2013 gathering in Homewood, Ala. Saturday. HOMEWOOD, Ala.– They saved the best for last as Kenji Lopez-Alt gave the keynote address, the culminating event tonight here at Food Blog South 2013. His presentation was chockfull of wisdom based on his years as a scientist trained at Massachusetts Institute of Technology and most recently as the chief creative officer for Serious Eats, a family of websites dedicated to the celebration of food started just six years ago. Even though this isn’t a food blog, this BAMAPRODUCER blog is as good a place as any to share some of the takeaways from the Lopez-Alt’s address, which was entitled “The Science of Good Blogging” here. A criticism of the organizers of this event– he hardly had enough time to present what I think was the most substantive address of this one-day conference. He was rushing through enough material for a 90-minute address, at times losing his place in his notes. You could tell he was scientist and yes, a cook too. But, public speaking may not be his favorite thing to do. Along with crude diagrams showing his thinking on various issues related to blogging, the presentation also included some tips for those who are blogging on anything anywhere, not just food or recipes. Instill TrustTo make a blog good, Lopez-Alt says one has to have a clear vision of what the blog is and once you start blogging, have a regular schedule of posting to it. If you’re blogging and reading and responding to questions from your audience, you’re doing your readers a disservice. According to Lopez-Alt, what’s good about blogs is also what can make them bad. Anyone can blog. Millions of voices can be expressed on blogs and they’re free. “Every opinion has an equal opportunity to be heard,” he reminded the 150 or so attendees who stayed around for his 5 p.m. keynote address.. This thirtysomething who was named by Food & Wine as one of the 40 Big Thinkers 40 and Under, believes his story is one full of lucky twists. You might say I’m glad one of those “lucky twists” brought him to food blog South 2013 here in the Birmingham metro area. Are you a Level 4 Blogger? According to Alt-Lopez, there are four levels of success when it comes to blogging. Level 4- Allows the blogger to be totally financially independent. Level 4 is where the fewest bloggers are today. I’m not sure I know many bloggers who can truly say they’ve made it to Level 2 where they’re making money on their posting. Since Alt-Lopez says you need BOTH Originality and QUALITY to make your blog stand-out, I think this one is definitely HIGH on QUALITY. Since it just reports on this important keynote address, there’s nothing original here. But, Alt-Lopez’s insights are definitely high-quality in nature. The true test of their impact will be in my future posts here. Let’s see if I learned anything. Better still, in the spirit of engaging my community, YOU TELL ME was this just high on quality or was there also some originality in this post? I promise to respond to your response. President Obama’s second inaugural address sent many like me looking for a better understanding of why he made mention of Seneca Falls, Selma and Stonewall. I have my answer and expect more from two journalism leaders Wednesday at University of Alabama. We’ve just held a national celebration of the birthday of Dr. Martin Luther King, Jr. and watched the inauguration of the nation’s first biracial president to a second term. Could there be any bigger diversity stories to top these? Well, yes, President Obama’s references to Stonewall and Seneca Falls in his inaugural address sent me looking for answers. ” We, the people, declare today that the most evident of truths –- that all of us are created equal –- is the star that guides us still; just as it guided our forebears through Seneca Falls, and Selma, and Stonewall,” Obama said. So, what was he talking about? I had heard of Stonewall and it’s connection to the gay rights movement. But, that’s about all I knew until now. Seneca Falls, New York was the site of what’s considered the first women’s rights convention in 1848. At least one Michigan Ph.D. candidate provided some context for Obama’s references. Austin McCoy suggested the references were a clear sign of what some have called “identify politics,” often associated with those who lean liberal or left of center. 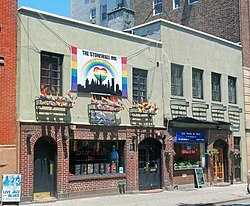 Thanks to National Public Radio’s Liz Halloran, I now have a better understanding of the story behind these places, especially Stonewall Inn, a bar in New York City. How appropriate that as I am learning more about the president’s speech, I will have the executive director of National Lesbian & Gay Journalists Association along with the Asian American Journalists Association in my Communication and Diversity class on Wednesday. I look forward to hearing what they have to say about the speech. But this whole experience perfectly illustrates the power of journalists and the media to expand our scope of understanding about issues of diversity and difference. Monday here in Tuscaloosa, I was learning about the civil rights movement in Tuscaloosa involving mostly African Americans. Today and tomorrow, I’ll be hearing about a movement for human rights for those who are in the lesbian and gay community. So my own horizons have been expanded so that I can pass it along to the students in my class. It’s what makes teaching this subject such a joy! An annual unity mass rally sponsored by the Southern Christian Leadership Conference of Tuscaloosa fell short in promoting a forward-looking vision for civil rights work in 2013. In the spirit of “lead by example,” I joined my University of Alabama students today in attending AT LEAST ONE event connected with the national celebration of the birthday of Dr. Martin Luther King, Jr.
My hope is that with the assignment, the students will be exposed to the whole impact that Dr. King has had on the country more than 40 years after his death. Sadly, this year’s Unity Mass rally, sponsored by the Tuscaloosa chapter of the Southern Christian Leadership Conference, did not deliver on the goals I had set for my students, who would have experienced this. I’m glad none of them attended this particular event. In fact, at 42, I was probably one of the youngest in the audience of about 200 at Tuscaloosa’s historic First African Baptist Church tonight. Here in Tuscaloosa, besides the Realizing the Dream committee, affiliated with the University of Alabama, the Tuscaloosa chapter of the Southern Christian Leadership Conference is the lead organizer of a series of events on the King National Holiday. SCLC President Rev. Roy Ferguson told his story of confronting the national guard on the night of Dr. King’s death in April of 1968. At the time, Ferguson was a student at what was then Mississippi Valley State College. Most of thos e in attendance were alive at the time. Many were involved in the civil rights era demonstrations here in Tuscaloosa. But, for those like me and my students who were born after the civil rights era, commemorative events like the annual mass rally are important educational opportunities. They are more than an annual tradition. As much as they are about reminding attendees of where African Americans (and the country) have come from, they MUST be about where we as a nation are going. Tonight’s mass rally spoke little about the CURRENT efforts of the Southern Christian Leadership Conference. No specific programmatic thrusts were outlined. Why should a young person care about the SCLC or any other civil rights organization NOW in 2013? As one of the ministers speaking tonight mentioned, it’s critical that those who were involved in the Civil Rights Movement make sure children who come behind them know how we got to where we are today. “We need to make sure and get some young people to fill this church the way it used to be,” said Earnest L. Palmer, senior pastor of Cornerstone Full Gospel Baptist Church, who presided over tonight’s program. My University of Alabama students have a writing assignment due this week that will explain the significance of their chosen event to their understanding of race and the sense of community. In the few years I’ve been in Tuscaloosa, I’ve learned that First African was significant because of its use of as a rallying point for efforts to confront such things as “Whites Only” signs at the Tuscaloosa County Courthouse in the 1960s. This was the church where on the same month as he delivered his famous “I Have a Dream Speech” 50 years ago this year, Dr. Martin Luther King , Jr. delivered the installation sermon for Rev. T.Y. Rogers, as the new pastor of First African Baptist Church. A year later in 1964, this same church was besieged by firehoses and tear gas as local police attempted to break up a rally and arrest protesters. So Why is the SCLC Needed Now? Each year when the nation pauses to remember and celebrate the work of Dr. King, we are equally as reminded of his work for justice, freedom and equality must continue in the year ahead. The keynote speaker at the unity mass rally Rev. James Williams of Newbern, Ala, did note issues such as dropout rate, teen pregnancy, gun violence are issues that are of importance to the SCLC. Unfortunately, just mentioning these issues as Rev. Williams did with the question “Are You Satisfied?” is not enough. It’s not enough to keep a new generation like my current college student crowd engaged. It’s not enough to rally the finances and memberships to propel the work of the SCLC forward. Following the Montgomery Bus Boycott in the 1950s, the SCLC was started by a group of ministers. Today, Tuscaloosa has no shortage of ministers. Many of them gathered at the mass rally tonight. But, there was no real “Call to Action” from these men of faith, only a plea for those in attendance to pay the SCLC $25 membership fee.